The early twentieth century witnessed the rise of middle-class mass periodicals that, while offering readers congenial material, also conveyed new depictions of manliness, liberal education, and the image of business leaders. "Should Your Boy Go to College?" asked one magazine story; and for over two decades these middle-class magazines answered, in numerous permutations, with a collective "yes!" In the course of interpreting these themes they reshaped the vision of a college education, and created the ideal of a college-educated businessman. Volume 24 of the Perspectives on the History of Higher Education: 2005 provides historical studies touching on contemporary concerns--gender, high-ability students, academic freedom, and, in the case of the Barnes Foundation, the authority of donor intent. Daniel Clark discusses the nuanced changes that occurred to the image of college at the turn of the century. Michael David Cohen offers an important corrective to stereotypes about gender relations in nineteenth-century coeducational colleges. Jane Robbins traces how the young National Research Council embraced the cause of how to identify and encourage superior students as a vehicle for incorporating wartime advances in psychological testing. Susan R. Richardson considers the long Texas tradition of political interference in university affairs. Finally, Edward Epstein and Marybeth Gasman shed historical light on the recent controversy surrounding the Barnes Foundation. 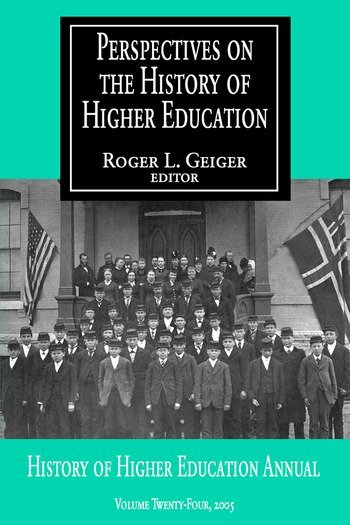 The volume also contains brief descriptions of twenty recent doctoral dissertations in the history of higher education. This serial publication will be of interest to historians, sociologists, and of course, educational policymakers.